Tap Gallery Theatre April 16 – May 3. Grab tickets here. Who is theatre for and what is theatre for? These are the central questions at the heart of Ross Mueller’s beautiful Australian play, Construction of the Human Heart. Written around ten years ago, when independent theatre in Melbourne was rather stifled for lack of space and opportunity, Ross Mueller observed the theatre going public comprised of repeat offenders, folk passionate about their role in the great theatre triumvirate of actor, writer and audience. Playing the part of audience (but never properly abandoning that of playwright) Mueller watched actors Fiona MacLeod and Todd MacDonald all those years ago and constructed an idea out of the actors stage chemistry and the experience of being an audience member. This idea morphed into a play pared right back to its naked throbbing heart about relationships, that of the great theatrical triumvirate as well as those we have with each other, culminating in that which we have with ourselves. You will be shocked to know there was no money in independent theatre back then (!) so true to his vision to create something local, out of local actors, for the local audience the local constraints are included in the fabric of Construction of the Human Heart. Ultimately Mueller was working on the idea of form matching content, and when all these elements came together through rehearsal constructed edits, a little piece of theatre magic was formed and produced. However, this is not the end of the story, for since that original performance, Construction of the Human Heart has expanded its reach, including a successful 2012 production in New York City. This is where the real magic of Construction of the Human Heart actualises and confounds theatre goers, because when most writers work to expand into a universal, Construction of the Human Heart was brought back into the local / personal only to find its own connections with the broader theatre conversation within those boundaries. 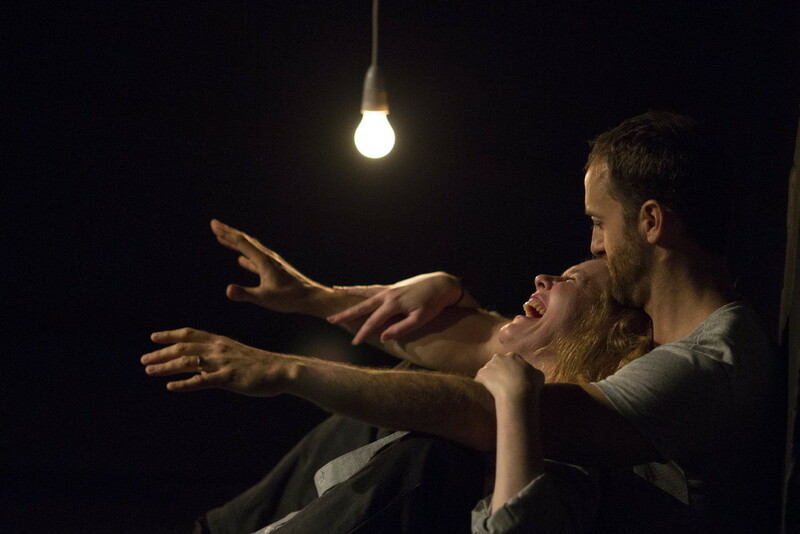 All these years later, with Apocalypse theatres beautiful presentation, response is still divided – is this play about relationships, words, loss, connection. grieving, theatre, or writing? Is it local or universal? What is clear however is the play’s remarkable ability to touch at the intimate level, a very piercing reach that leaves the theatre goer with the experience they were, not just included, but needed – because indeed they were, right from the start. Construction of the Human Heart is a play written for actors and audiences so it infuses each with the remarkable sense of potent contact. Some of the referencing seems dated (Elle MacPherson as the pinnacle of beauty) and at the same time, the theatrical allusion, so heavily grounded in a particular place and time, is able to make its way through to a contemporary audience, who recognise the reference in their own way, transmuting and altering the play within their own perspective. Sydney theatre audiences in 2014 aren’t that much different from the Gen X theatre making play watchers of Melbourne ten years ago, but one can’t imagine Construction of the Human Heart’s local intimacy appealing to an American audience – and yet it did. However, if Mueller’s intention to reach across those borders wasn’t deliberate, his reach within was so complete, his words are able to form their own tentacles, remarkably providing the relief of recognition to a passionate theatre loving audience. Cullen and Martin are a superb Him and Her, with Cullen’s performance as an indirect reaching delicately mixing in the air with Martin’s more studied, mask like performance-as-actor. This couple are grieving, and she’s putting on a brave face and he’s reaching out for her, and we see them through the roles they play, watchers shamelessly invited into an intimacy one normally confesses to observing in secret whispers. Theatre is immediate, ephemeral, and yet sharply observational. Him and Her let us in, they welcome the audiences gaze, as if it were an inevitability, despite its essentiality. In Construction of the Human Heart the fourth wall is broken because the audience is known to be a crucial part of its structure and they are drawn into the play, rather than reached for across a divide. It is this remarkable experience that makes Construction of the Human Heart an essential experience for any Sydney theatre lover. One can be assured Apocalypse theatre Company have made a production worthy of the words, the actors and the audience passionate about their theatre.